The list below represents most of the screenplays I’ve written. They have won 19 competitions and came in second place in 16 others. Some are in various stages of negotiation with producers and/or managers of talent. No commitments have been made as of today, and no checks have been signed. Please note that all screenplays are copyrighted. 1) Hat Trick, a Feature Screenplay -- for the longest time was the winningest screenplay on Moviebytes.com - won 10 competitions; 2nd place in 5 others. This story holds a special interest for me. Originally, I imagined what would happen if a Jim Brown-like character tried to redeem himself on the football field 30 years after retiring. A second character quickly emerged (imagine Walter Matthau) who generated the most influence in the story. Although this is my most successful script, it only took a month to write. The script won Fade In Magazine, Woodshole Film Festival, Split-Screen Competition, Telluride Indiefest, Zoiefest and Seventh Dimension Competition. It also came in second place at the Phoenix Film Festival, Hollywood Scriptwriting Institute, Pocono Mountain Film Festival and Breckenridge Festival. In total, Hat Trick has placed in over 40 screenplay, festival and theatre competitions since 2000. A retired cop streaks naked down the field during the present-day Army/Navy game believing his heroics will atone for a fumble he made decades ago during the same football classic. Although he takes his two friends on this wacky gridiron adventure proving life in retirement is anything but sedentary, dozens of security guards await him and it’ll be a friggin’ miracle if he makes it into the end-zone. Once Hat Trick was completed, Lois, my wife, saw a documentary where an older, mainstream actress, complained about the scarcity of scripts for actors getting up in age. This prompted me to accommodate three women in their 50’s or 60’s (or older perhaps). This script placed in a dozen competitions. Some of them are, Tennessee (TSA), Writer’s Digest, Chesterfield (Paramount sponsored), Cinestory, Writer’s Network, plus more. Now, quite unexpectedly, a friend of mine from high school, Drew Keil, a community theatre actor on Long Island - a wonderful thespian - and a writer for over 30 years, had an idea to change Going Solo. Much to his credit, the re-write of Going Solo wasn't a rewrite at all. It became a unique project that took on a life of its own. So, I retired my version of Going Solo, and I'm presenting the work Drew and I spent over a year working on as a collaborative effort. Good thing. Since his involvement it has won the Chicago Screenplay Contest, American Movie Awards and London Film Awards. An agoraphobic mom who works at home with two middle-aged, love-starved friends discovers her estranged daughter will perform a solo at Carnegie Hall, so how the heck is she going to travel the scary streets of New York City when she can’t even walk 30 paces to get the mail? I befriended WC Pinkston when both of us were auditioning for work (acting) in Philadelphia. I wrote one of the script’s main characters, CW Gavin, for WC Pinkston (note the reversal of WC). I was to play the other main character, Boo Hoo Flanagan. As fate would have it, Mr. Pinkston and I got busy doing other things, but we keep in touch and explore ways to get the script into the right hands. A black officer in personal turmoil coaches the inmate basketball team and finds the strength and motivation he needs, both in life and on the job, in an aging, white, crippled inmate who shoots three-point baskets better than anyone has ever seen. 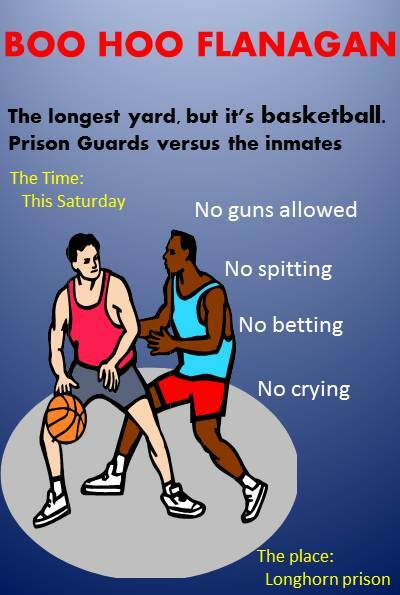 Or – The Longest Yard except it’s basketball with a little Shawshank Redemption thrown in. 4) Terror On The Run, a Feature Screenplay Who hasn’t been affected by 9/11? This tragic event spurred all sorts of emotions, and this story is the end result of my physiological struggle on how to deal with it. How do you wipe out a terrorist organization who is training in the heart of Iraq while also inspiring Arab Sultans in the Mid-East to join with Western nations in a global war against international terrorism? Our heroes do it. Click here for the 'Terror on the Run' screenplay. I was originally approached by Ken Keller (NYC producer) to re-write a story about a year in the life of a minor league hockey player. Based on a true story by Jerry Gaughan, the screenplay took on a life of its own and we seek a champion who likes hockey and family-oriented tales. Adopted at infancy, a professional minor league ice hockey player searches for his biological parents during a championship season where his dream of playing for the Pittsburgh Penguins hangs on a thread and a prayer, but his quest to find his birth parents is more disruptive than expected and he finds himself more on a journey of enlightenment than discovery. In 1992 and ’93 I struggled with the worst nightmare of my AT&T career – a downsizing process which gnawed at my psyche. Forced to adhere to a new ‘corporate policy’ of rating half the work force into the average or below categories, I had to reverse my mid-year reviews of a couple of people who worked for me into a lower rating. That following March there was a massive layoff whereby the people selected to leave were those folks ranked in average or below categories. Even though the people who worked for me found other jobs within the company, this left me with a terrible feeling that job security in the workforce would never be the same as it was when he first signed up with “Ma Bell” for life. This script is the result of that experience. 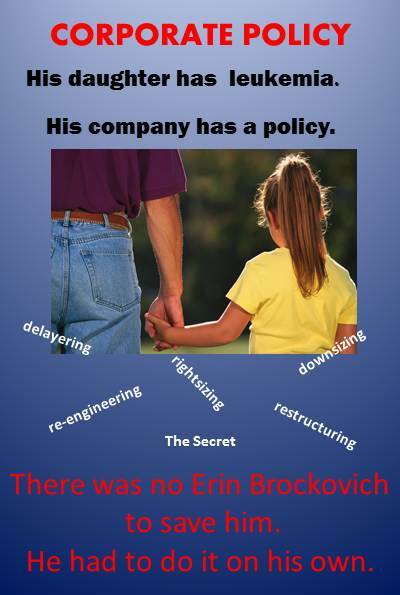 Greedy executives of a large corporation implement an illegal downsizing process, and they would’ve gotten away with it, but they didn’t count on a desperate employee whose courage and family loyalty proves much stronger than any of their corporate policies. Click here for the Corporate Policy Synopsis. Click here for the Corporate Policy Screenplay. When I called my old high school buddy after almost 40 years of separation, I was stunned to find out to find Ed was still pursuing his life-long dream of acting and directing. This prompted me to team with him to write his story. After taping 28 hours of conversation, transcribing it to print and mulling over historical videos and documents, the end result is a wonderful story about my buddy in the from of a two-part mini-series screenplay. Ed always wanted to act or direct in theatre, but a lifelong battle with booze, and the bizarre hallucinations of famous dead people and spiders the size of dogs, took him on a physiological journey where he struggled to find peace between the worlds of the real and the imaginary. A true story. This script kind of snuck up on me. Unlike the novel I published under the same name in the late 70’s, this work evolved into a sequel to the book. It’s also a more mature look at the dramatic possibilities of events stemming from two nut cases who have access to the long distance telephone network during a time when eavesdropping was much easier – before divestiture, that is. When a telephone worker invades the public’s privacy by using the telephone lines to find the man who killed his wife, he inadvertently becomes a pawn in a twisted tale of espionage and intrigue. Click here for the Gods of Bell synopsis. After writing the novel based on the same name, I was plagued with the idea of writing the screenplay. It was a journey of love and it sat on the shelf as a 180 page epic that I was touting as a mini-series. In spite of its size, it won the Spirit Quest Film Festival in 2010, but I was determined to reduce the size and finally, at 118 pages, it is production-ready as a 2-hour feature. Click here for the 'South of Main Street' Screenplay. Based on a joke I never get tired of telling, this story evolved into a 7-page short screenplay. Originally set outdoors, it was moved into a living room so the skit could be performed on stage as well as on film. Ever try and control an eight-year-old boy’s mouth? One mother tries and nearly loses her mind. Or, A mother's dim wit, a child's mischievous behavior and a father's blasé attitude on child rearing clash in harrowing experience that has the mother close to a nervous breakdown. Click here for the 'Get the Hell Off' Screenplay. This is my most recent work which I co-wrote with my wife. It's inspired by our grandchildren and great-grandchildren. There is really nothing I can say except this was a labor of love. Floored by depression when his wife dies, Joe’s 32 year-old addicted and pregnant daughter appears on his doorstep and, while she provides more drama then he can handle, his soon-to-be-granddaughter will give him reason to embrace a happy life again. Click here for 'The Barking Spider' Synopsis. 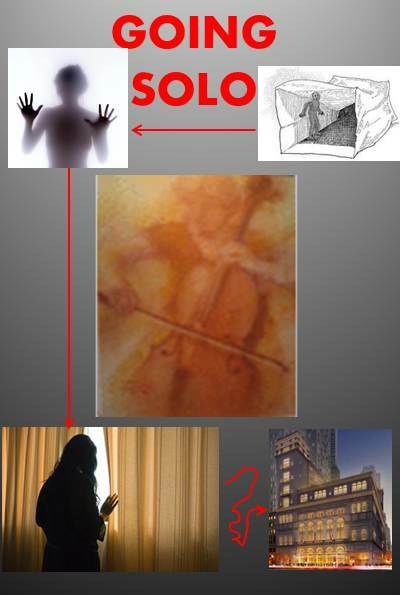 Click here for 'The Barking Spider' Short 29-page Screenplay. Click here for 'The Barking Spider' Feature Screenplay. This is possibly my most ambitious piece in that it's a true story where I interviewed one of our great, unsung heroes for over a year to gain insight to his journey. I can't say much about it for he and his family's safety is more important than advertising our accomplishment. I will give you the logline, but the synopsis and script must remain out of the public eye until I can gain mainstream interest. The non-fiction book is finished and ready for print, and was almost published, but the ultimate veracity of the fantastic tales written in the book was more than a publisher wished to tell for, after all, "who is Robert Gately and, more to the point, who is Kazmi". Well, his anonymity is still in tact and his safety is of primary importance. Having said this, I have also finished the first feature of what should be a trilogy. Kazmi had everything to live for in Pakistan: riches, honor, respect of his countrymen, and love of family. So, why did he risk it all to become an American FBI and DEA informant?